A team of Scandinavian Nessie hunters have been told not to deploy any nets in Loch Ness and not to try taking skin samples from any animals that may live within. Jan Ove Sundberg, leader of the Global Underwater Search Team (GUST) last visited the loch in April to search for sounds with hydrophones and digital audio sampling equipment from the Swedish Navy. He recorded some sounds that were unidentifiable and decided to return in October to see if the sounds could still be found. Unfortunately, the authorities seem to suspect that Mr. Sundberg’s team intends to deploy a cod net to try and capture one of 60 Nessie beasts Mr. Sundberg reportedly believes may live in the loch. This could place the team in breach of “The Protection of Animals (Scotland) Act of 1912” and any attempt to take a skin sample could also place them in breach of “The Veternary Surgeons Act 1966”. Inspector John Grierson, animals officer with Northern Constabulary warned that action could be taken against anyone harming, or failing to protect any animal. He has been reported in the local Press & Journal newspaper saying, “If there is a monster and it is netted then it would be protected against any cruel activity. It could be argued that to place a wild animal in a net when it could become frantic and thresh about could be considered cruel… “But since it has not been proved that the Loch Ness Monster exists, it is a fine legal point whether Mr Sundberg would actually be breaking any laws by simply trying to catch her with a net”. However, whether trying to net Nessie is legal or not, Fisheries Protection Board bailiff Donald MacLeod pointed out that it was illegal to net for salmon or trout in the loch. Penalties include heavy fines and even confiscation of boats and equipment. 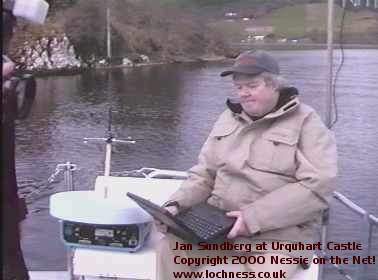 Remember: You can try and spot Jan Sunberg’s expedition out on Loch Ness via Nessie on the Net’s live webcam. Latest: Visitors Warned: "Do Not Throw Chickens into Loch Ness"